Evaluation-Board-TECEV104-for-TEC-Controllers-TECA1-5V-5V-D - Analog Technologies, Inc.
TEC controllers are used for driving TECs (Thermo-Electric Coolers) with high stability in regulating the object temperature, high energy efficiency, zero EMI, and small package. Effective evaluation of TEC controllers can be done by using the TECEV104 Evaluation Board. This evaluation board is mainly used for purposes of tuning the TEC controller's external compensation network so as to match the characteristics of users’ thermal load. Tuning facilitates minimization of the thermal control loop’s response time whilst keeping the control loop stable. 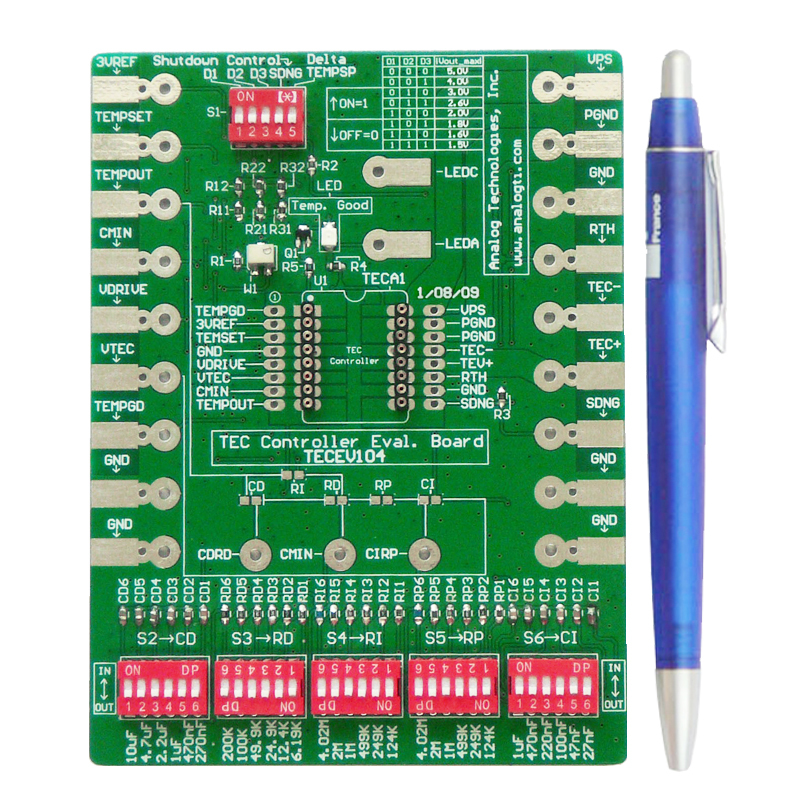 This Evaluation Board, TECEV104, is compatible with the TECA1-xV-xV-D, TECA1-xV-xV-DAH, TEC5V4A-D and TEC5V6A-D TEC controllers. 1. A complete tuning and application circuit used for driving a TEC, setting output voltage limit, tuning the compensation network, and setting set-point temperature point for the thermal load. 2. LED for displaying the controller’s temperature status. 3. Multiple connection pads to allow for connecting with external instruments and components. 4. The evaluation board works for all the TECA1 series TEC controllers, TECA1-xV-xV-DAH series TEC controllers, TEC5V4A-D and TEC5V6A-D TEC controllers.